Have you ever watched a crime show or murder mystery and thought that the connecting of dots and human error involved with important evidence seemed orchestrated or contrived? Set aside a little time and check out some true crime stories, often chronicled on TV shows like The First 48, Forensic Files, or even episodes of NBC's Dateline, and you'll find that the discovery of a "convenient" item or the elaborate thought-process behind certain evidence is common and has a long, documented history. Netflix's landmark show Making a Murderer -- a decade-long documentary chronicling the murder accusations and courtroom woes of Steven Avery -- became a household name based on this idea, to such a degree that it spawned a partly-comedic spoof on both its exciting mystery pacing and its themes: American Vandal, which also appeared on Netflix. What begins as a spoof, however, becomes a shrewd and frequently effective whodunit on its own terms. 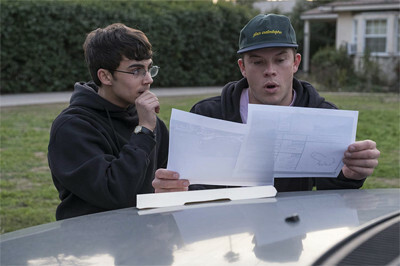 Instead of a small town, American Vandal takes place in the community of a high-school … and instead of murder, the crime committed centers on the vandalization of over two-dozen cars in the school's parking lot. All evidence seems to point at Dylan, a slacker and notorious prankster who would fit the prototype of who'd be responsible for such a gag; however, Dylan denies the accusations, claiming that he's being framed. His denials draw the attention of two aspiring filmmakers, Peter and Sam -- both involved with shooting the school's morning TV program -- who take on the roles of both documentarians and investigators as they dissect the details of the case for and against their subject. As more details come out about Dylan's girlfriend, kids out for popularity and reputation, sketchy teachers and other irregularities within the school's infrastructure, the documentary begins to unearth a bunch of facets that shake up the high-school atmosphere, putting Peter and Sam in jeopardy. At first, American Vandal goes at the subject in an entirely tongue-in-cheek manner, hinging the entire crime being committed on some … uh, vulgar graffiti that's more amusing to learn about on your own terms than for me to give it away here. The show systematically takes a docket of things that were popularized in Making a Murderer and deliberately spins them into an amusing high-school atmosphere, generating laughs as it reveals the extent of Dylan's cleverness, his reputation with the rest of the school, and how the other suspects are evaluated based on the assumptions that he didn't do it. While the humor works really well -- the dissection of details within the vulgar graffiti is pretty hilarious, at first -- American Vandal slowly begins to take itself seriously, even with elements that seem like they're designed for nothing but amusement. The compulsion to watch the next episode isn't based around how it'll make you laugh, instead in what pieces of the puzzle will be revealed next. Now, American Vandal isn't authentic enough to take completely seriously once it starts to evolve into an outright mystery worth following. For instance, there's a scene where a teacher sits down for an interview with the two male students and casually -- yet enthusiastically -- divulges exactly how attractive he thinks one of the female students is between talking about the vandalism. Even when the scene initially plays for humor, it goes too far and takes the viewer out of the relative realism being crafted around the case; however, the fact that he did so becomes a key element of the mystery's progression, and weakens the integrity of the show once it gets in a more serious rhythm. Yes, human error has led to the discovery of incredibly obvious and dumb evidence left around, and people have blurted out things for no apparent reason that get them in trouble, but the show eventually makes its viewers want these idiosyncrasies to be kept at a minimum so that the suspense can credibly follow through to the end, and avoid falling back on its satire for logical passes. It doesn't quite do so. American Vandal starts to remind me of Rian Johnson's Brick once it digs deeper into the vandalism case, in which the moving parts of an adult-caliber issue reflect upon the current state of high-schoolers and how they perceive others. The way that a high-profile case has been recontextualized for suspension from school reveals a wealth of cleverness, from the difference in burden-of-proof to how a criminal act of reasonably low severity could have a significant impact on younger individuals within its sphere, whether it's accomplices to the act or learning about other people's unrelated wrongdoings brought to light by the investigation. It also smartly uses the digital age of immediately uploading data to its advantage, offering commentary both on the hostility around journalism and the impact that allegations or dirty little secrets can have on reputations. I was surprised at the substance that gradually sinks into the tension built around a high-caliber prank. Twists and turns abound in American Vandal through its smartly-crafted and immersive mockumentary construction, where the real-time discoveries of Peter and Sam result in clever red herrings and second-guessing of who's responsible for the incident. What's impressive about how it all wraps up is that it doesn't take the easy way out: the damage has been done by the details learned by students and teachers both, and it can't be reversed. The reveal of who's responsible for the prank isn't terribly climactic or conclusive -- you'd think Peter or Sam would've done a bit of due diligence that would've bypassed -- but the ambiguous directions taken by American Vandal make up for it in meaningfulness, leaving whoever's watched the documentary, both in universe and on the other side of the screen, with some hairy issues to consider. Each disc of American Vandal comes equipped with four 40-plus minute episodes, so we're essentially working with a long movie's worth of content crammed onto each one. The quality's about what you'd expect out of a modern, digitally-shot series condensed into standard-definition: it looks great, if a bit smooth and restrained in color at a few points. The documentary aesthetic allows the camerawork to do a lot of refocusing and zeroing in on details, and the clarity of fine points in hair, clothes, and earthy and urban textures gets a lot done with little effort, approaching HD clarity when upscaled. The palette leans a little less colorful, but that fits with the true-crime intentions of the project, and the richness of red spraypaint, the vibrancy of green foliage, and skin tones are impressive under the circumstances. Not an interesting collection of DVD transfers, but it wraps up the case well enough. The soundtrack for American Vandal is all about subtle shifts in the ambience of verbal delivery: most of it revolves around face-to-face interviews that exhibit universally fine clarity, while other scenes are recorded from camera phones and exhibit the inherent flatness of the circumstances. The 5.1 Dolby Digital tracks ensure that the dialogue's discernibility and richness of range are captured, while allowing the intentionally garbled elements of the track -- such as listening really, really hard to a voice recorded by a phone during a high-school party -- to remain appropriate clear alongside the show's intentions. A few sound effects utilize the upper-end of the track reasonably well, such as the hiss of a spray can, but most of it merely flows together with the rest of the show's middle-of-the-road, deliberately serviceable quality. Only a handful of extras have been included with American Vandal: Season One, all technically "in-universe", led off with Point / Counterpoint: Alex Trimboli vs. The Wayback Boyz (14:06, 16x9). It mostly features the obnoxious Alex character from the show going on about his good deeds, then featuring Dylan's friends saying something in cutaway responses that take him down or conflict with his claim. Meh. There's also a series of Extended Interviews with characters Dylan Maxwell (16:46, 16x9) on Disc One and Mr. "Kraz" Krazinski (15:31, 16x9) on Disc Two, as well as an Extended School Board Hearing (10:36, 16x9). American Vandal begins as a sharp, amusing spoof and progresses into its own compelling little crime-story thriller, where the stakes of suspension over school vandalism are elevated to level of even an unsolved murder mystery. There's some roughness here and there in how clues are placed and details are divulged verbally, things that wouldn't matter at all had the show stuck uniformly to being a comedy. Thing is, the tone and pace of the show effortlessly grips those watching, which makes people want to actually discover more about the truth behind the case's accusations against the seemingly guilty Dylan. Because of that versatility, it makes someone want to take details more seriously and engage with the themes more deeply than they probably should in the space of a spoof, thus making its missteps seem bigger in comparison. It's an exhilarating, fast-moving ride, though, and well worth checking out. Recommended.